ADAM22 is a member of the ADAM gene family which bind integrin and may play a role in cell-to-cell or cell-to-matrix interations. ADAM22 is unique in that it is only observed in the nervous system and predominantly in brain. ADAM22 is attached by cytoskeletal scaffolds to the postsynaptic density and is a receptor for LGI1. Antigen: Fusion protein corresponding to aa 444-526, the extracellular disintegrin domain, of mouse ADAM22 (accession no. Q9R1V6). This antibody recognizes mouse, rat, and human (weak) ADAM22. It does not cross-react with ADAM11. 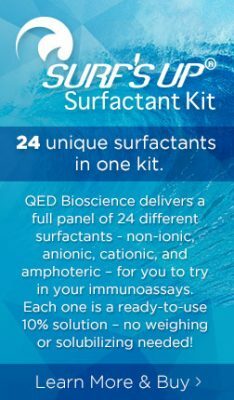 Immunoblotting: use at 1ug/ml. Predicted molecular weight is ~90kDa.